The mountainous countryside surrounding our 1840 log cabin is Appalachian in character. It’s Bedford County, PA, land originally surveyed in the 1760s by a well-traveled fellow named George Washington. Back then, it was farmland, and much of it still is, even though most of today’s farmers have jobs elsewhere too. The land is very hilly and rocky, so much so, that you have to marvel at the tenacity of those first settlers scratching out a living for their families. We should check back with the Reverend. Maybe he’s moved into a new career in stand-up. Just learned it’s too late. He has ascended to his microphone up there. I’ve occasionally thought of that encounter with the reverend, particularly when I’ve broken a piece of the willowware. I save the shards with the notion that I might embed them into a wood top on a coffee table. But that will have to wait for a few more breaks. 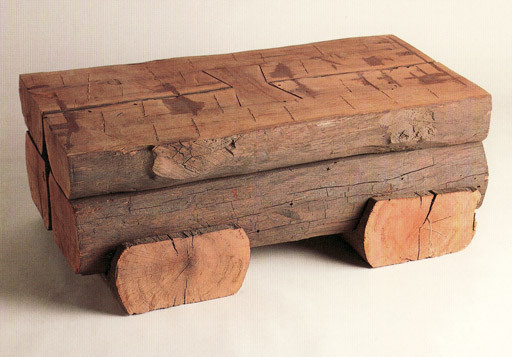 This coffee table is named for the butterfly that holds the two top logs (log cabin origin) together.